For the first time since the introduction of Hamas-operated children's summer camps in the Gaza Strip, a new and special course has been opened for senior figures' kids involving elaborate weapons training. Last week, the Palestinian SPA news agency released the first images from the graduation ceremony of Gaza's privileged class. The event was organized by Hamas' interior ministry responsible for the group's armed forces, and was attended by many Hamas ministers and legislators. Hamas' next generation displayed various operational abilities honed during the summer such as security of high profile figures in public places. As part of the ceremony, the trainees were given graduation certificates. Hamas prime minister in Gaza Ismail Haniyeh participated in the event and praised the camp's managers for their "political and morale-based guidance." He further noted that the interior ministry is "working to train its soldiers armed both with weapons and Islam and Koran convictions for the benefit of their people." After the ceremony a source from the ministry said, "Defense and security are a natural need that is meant to protect the Islamic project we are leading against the enemies of the Palestinian people and its religion." 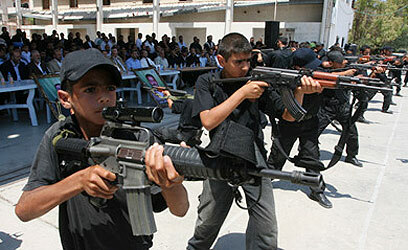 See all talkbacks "Hamas summer camp: Weapons training for leaders' kids"